Even though this was the third time on this course, every one of these events is different. And you never know what version of you will show up on race day. You spend four or more months getting ready, but there is no guarantee that something won't derail you at the last minute. Something unexpected, or something you yourself caused. It has been a long time since I showed up to a start line feeling confident, and I was feeling pretty iffy again this time around. 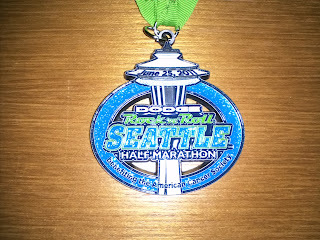 The half marathon was one of the main reasons for the visit to Seattle, but of course there were a ton of people I wanted to see over the long weekend. Friday was filled with visits, and I ended up sacrificing sleep in order to spend more time with people. I ended up getting about 3 hours of sleep the night before the race. The bottle of wine didn't help either. Our crew showed up very early at the start line in order to avoid the crush of runners waiting to get on the shuttle buses. Tami had arranged for some passes to the Brooks VIPee lounge. With the secret sticker, we had access to flush toilets and could avoid the porta-pottie lines. However, lots of other people had the stickers as well, and the line was still 25 minutes long right before the start. The gun went off while I was jogging to the start line, and I just caught my corral before they took off. I decided to run with a pace group again. If I could keep up with them, I would cut 5 minutes off of my PR. A finish time of 1:45 was sort of symbolic for me as well. It equated to an 8:00 minute per mile pace, and that is what I would have had to run for a full marathon to qualify for Boston. That is before they made the standards harder for everyone by 6 minutes. The weather was near perfect for a long run. The sky was overcast, a little cool and no rain. I reached the start line with about 45 seconds to spare. I took a couple of breaths, and then remembered that I had to fire up the electronic gizmos. I downloaded the iMapMyRun app for my phone, and it was supposed to broadcast my run live for anyone who wanted to watch. I have no idea if anyone was following along vicariously, but it added a little pressure somehow. I started some distance behind the pacer, and I took a half mile or so to reel him in. He kept us right at an 8 minute pace and I could just follow along and check out the scenery. There is a long slow climb from mile 3 to 5, and we maintained pace. When the road tipped downhill to meet Lake Washington Blvd, gravity carried me ahead of the pacer. I decided at that point to push a fraction harder. I figured the pacer was right behind me and would catch up at the next water stop. But when I slowed to take a drink, he did not go running by. Still feeling good and running within myself, I pressed on. The boulevard was beautiful once again, and then at mile 7 I saw the trees, the blue signs and American flags. I probably slowed down a bit as I took it all in, but then the beautiful moments fueled me to press on another fraction harder. After another climb at mile 9, the route heads through the sweatbox of the I-90 tunnel. After a wall of sound and heat, we emerged into the open air and into downtown. Last year this is where I picked up all my time, and I tried to pick up as many seconds as possible again this year. I felt like I was pushing just hard enough without going too far into the red. A quick climb to the Viaduct, and then two more turns and we were in the finishing chute. I picked it up just a little more, but didn't have enough in the tank to sprint it out. It reinforced the feeling that I had paced it out perfectly, and I finished with a smile. Final time - 1:41:46. I beat my goal by more than three minutes, and set a personal best by almost nine minutes. It was one of those rare days where everything seemed to go right, even though I had tried to sabotage myself the night before. Couldn't have asked for much of a better run. And the mental bonus - if I could have somehow sustained that pace for another 13.1 miles, that time would get me into Boston under the new standards. A marathon is much more than twice as difficult as a half, but it still gives me a glimmer of hope that Boston is within the realm of possibility. 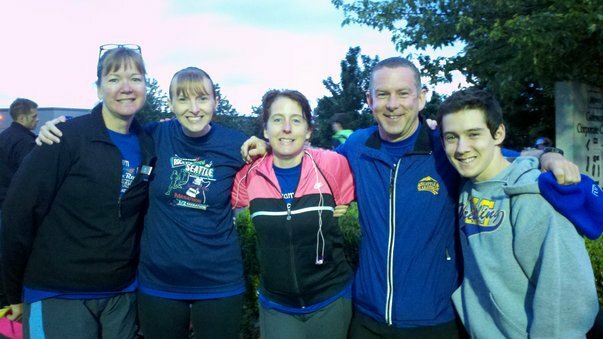 Everyone in our group ran faster than last year, and three people set personal bests, so there was success all around. And in the three years I have run this course, I have set a new personal best for the distance each time. 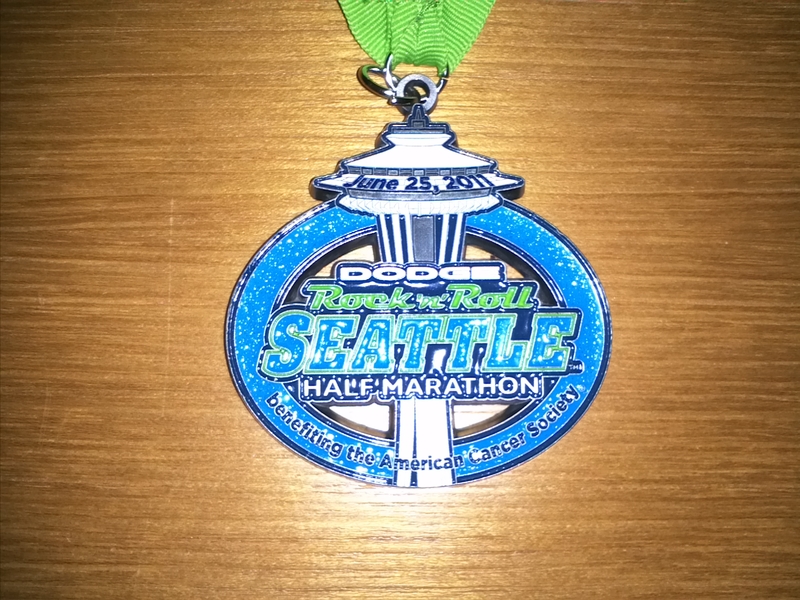 The Seattle course may be my lucky charm. That and the friends and overcast skies. Nicely written, makes me feel like I was there!